King Solomon's Mines has had quite the lifespan. The story began life in 1885 as an adventure novel by H. Rider Haggard. Some call Haggard the father of the "Lost World" sub-genre, and still others consider him to be the ancestor of the kind of pulp fiction that dominated comic and newsstand shelves from the '30s to the '60s. There have been six feature films based on his book, with the most notable movie versions being made in 1937 and 1950. This 1985 version is the first one that seems to be made with laughs in mind. Honestly, I don't think much of what was in that original novel has survived for the screen in this particular adaptation. 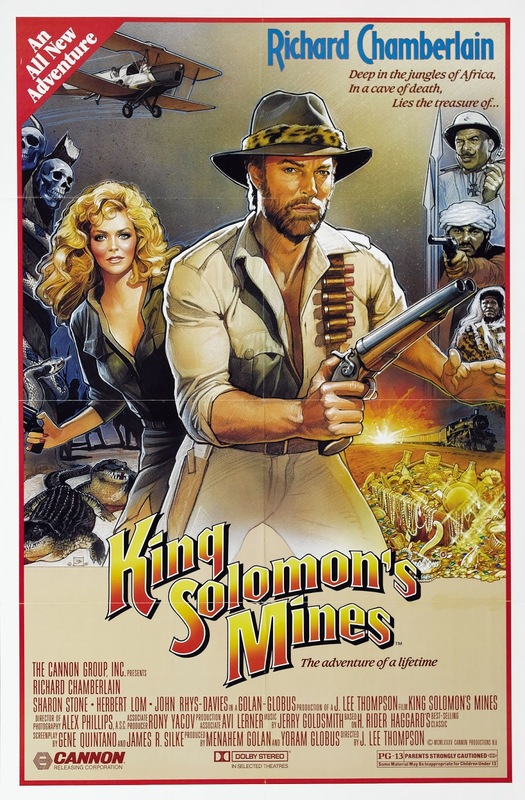 Now, thanks to Olive Films, I've recently had a chance to revisit Cannon's 1985's pulp adventure film King Solomon's Mines. I hadn't watched the movie in years, probably since the '90s, and I was excited to see how it held up. Thankfully, there are no bad Cannon movies...let me rephrase: there are lots of bad Cannon movies, but they're bad in a way that makes them eminently watchable. 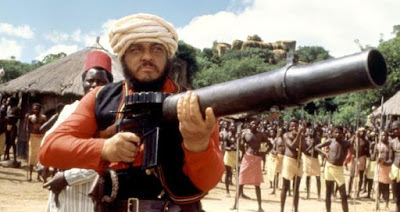 The Cannon Group were perhaps the most mainstream and successful purveyors of exploitation in the history of movies, usually able to coax decent talent into working on movies that were far beneath the standards of typical studios (they landed Sylvester Stallone at what was arguably the peak of his action icon status). For those of us who were alive in the 1980s, Cannon built a large part of our childhood with exploitation classics like American Ninja, Missing in Action, Delta Force, Cobra, Masters of the Universe, and one of my all-time favorite martial arts movies, Bloodsport. If you aren't familiar with the documentary Electric Boogaloo, you should run, not walk, to Amazon to pick up the dirt-cheap DVD about the history and legacy of Cannon. The studio was also known to chase current movie trends in hopes of capitalizing on them, and such is the case for King Solomon's Mines. 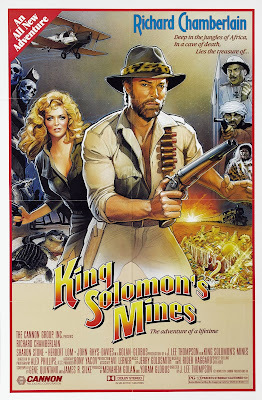 Without a doubt, King Solomon's Mines is an out-and-out "tribute" (read: rip-off) of Indiana Jones and the success Spielberg, Lucas, and Harrison Ford had found with Raiders of the Lost Ark and Indiana Jones and the Temple of Doom. It's so much of a "tribute" that it lifts entire scenes from those movies and recreates them, sometimes with a slight change. You know the scene in Raiders where Indy is looking for Marian, who has been taken away in a wicker basket? Here the basket is replaced with a rolled carpet. The famous scene where Indy fights a Nazi on, in, and under a Jeep? Here it's a train. Instead of running from angry natives who want their idol back, Alan Quatermain runs from a bunch of cannibals. There's no giant, rolling boulder, but there is a huge rolling cooking pot. I kid you not. If you thought that the Indiana Jones films were too gritty and realistic, or that their production values were too high, then this is the movie for you. In spite of occasional bursts of violence, there's also a sense of wackiness that seeps into nearly every moment of King Solomon's Mines. Some of it works, but a lot of it falls flat. In an attempt to copy the winking, impossible heroics of Indiana Jones, this film pushes things a bit too far into the camp category, That's okay. Somehow it all works well enough to be entertaining. This is a B-movie with A-movie aspirations. King Solomon's Mines is cast incredibly well. 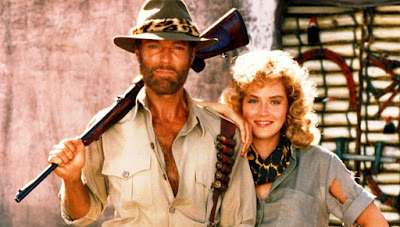 Richard Chamberlain is Allan Quatermain, our Indy stand-in with a fur-trimmed fedora. Somehow, Cannon always managed to find these actors when they were at their peak of desirability. In Chamberlain's case, he'd just experienced massive success in the handful of years before this movie with his starring roles in two television mini-series events, Shogun and The Thorn Birds. At this point in his career, he was a TV Guide cover boy and every woman in America had a crush on him. Some of the dudes, too! Sharon Stone makes what is essentially her major motion debut here (she'd done small parts, but this was her breakout) as the heroine, Jesse Huston. Famously, there's a story recounting how quickly and sloppily the casting process actually was: Cannon co-owner and producer Menahem Golan wanted "that Stone woman," apparently referring to Kathleen Turner, who had just appeared in Romancing the Stone. Sharon Stone was hired by mistake, and that was that. King Solomon's Mines also wisely casts an actor from Raiders of the Lost Ark with John Rhys-Davis (Indy's friend Sallah, not to mention the dwarf Gimli in Lord of the Rings) in a villainous turn that the actor must have relished. Herbert Lom, from Spartacus, is the German colonel after the titular mines. Of personal interest to me and maybe a few others out there is the casting of English thespian Bernard Archard, here uncredited, as the father of Sharon Stone's character. Archard starred as Marcus Scarman in my absolutely favorite Doctor Who serial, The Pyramids of Mars from 1975. It's a popular episode from early in Tom Baker's run as The Doctor, and Archard was a truly terrifying bad guy in that four-part story. It's nice to see him here in a different kind of role. I can't fathom why he didn't get credit, especially since his character is the McGuffin that gets the whole story rolling. It's hard not to talk about King Solomon's Mines without mentioning the score from Jerry Goldsmith. It's rousing and adventurous, but it also sounds almost exactly like the score that he wrote for Rambo: First Blood Part II six months before this one. I don't know...I mean, I like them both, even if they are almost identical. In what I consider to be an ironic twist, both this score and the music for Rambo: First Blood Part II were nominated for WORST music awards by the Golden Raspberry folks. Sir? Do we get to win this time? In the case of Rambo, yes, you win worst song from a movie, but you have to share it with Frank Stallone. How do you live? One day at a time. I would be remiss to discuss King Solomon's Mines without mentioning the direction of J. Lee Thompson. Even though there's not a particularly-strong authorial hand at work here, Thomson was a capable director who was behind several other cult classics like Firewalker, Conquest of the Planet of the Apes, and a whole bunch of Charles Bronson movies from this era (Deathwish 4 being the one that stands out the most). However, Thomson came from the golden age of Hollywood and was behind some true cinema classics, such as The Guns of Navarone, MacKenna's Gold, and my favorite movie that he directed,the 1962 original version of Cape Fear, starring Robert Mitchum and Gregory Peck. It's so interesting to see how directors like Thomson went from the classic era of films into crowd-pleasing stuff like what Cannon cranked out. Technically, the Olive Films Blu-ray is pretty solid; I've never seen the movie look this good. I didn't notice any problems, and the print seems to be very clean and clear; even the rear-projection photography (and there's a bunch of it) somehow looks decent. Sadly, there aren't any extras on the disc. I would have loved a commentary, if not from someone who was there, then by a fan or an "expert." A retrospective featurette to give us some context would have been even better. But that's not really what Olive does, and I commend them for getting this movie out in HD for cinephiles like me. Olive Films also released the sequel, Allan Quatermain and the Lost City of Gold, back in 2015, but that disc is not yet part of my collection. After having watched King Solomon's Mines and enjoying myself quite a bit, I'm going to have to do something about that. These are exactly the kinds of movies that this site was created for; besides, what kid of the '80s wouldn't want a complete Cannon collection? After all, it belongs in a museum. You can pick up the Blu-ray or DVD here.